(1) Guest Editorial - Do you think of yourself as sick? - IC author Julie Beyer RD asks you to ponder the question do you think of yourself as sick? with some outstanding suggestions that can help each one of us refocus our thinking and daily lives on health rather than sickness. (2) Feature Story - Gluten-Free, Wheat-Free or the Paleo? Diet's People Are Talking About - The hot topic of the summer is grains: are they healthy for us? do they promote inflammation? Do IC patients see an improvement by avoiding grains? In our feature story, ICN writer Stacey Shannon shares several very encouraging patient stories and explores the pros and cons of trying a gluten free, wheat free and paleo diet. (3) Inside AUA 2012: State of the Art Treatment Approach For IC - The highlight of AUA Annual Meeting last May was a panel discussion held on the last day of the event which explored state of the art treatments for IC by creating a plan using a patients unique phenotype. We discuss and explore how a custom phenotype is created for patients and potential treatment options. 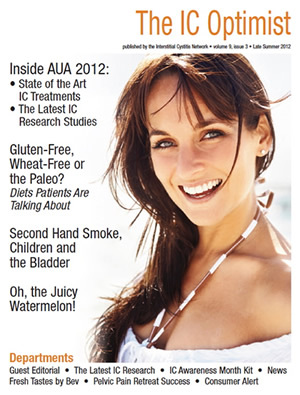 (4) Inside AUA 2012: The Latest IC Research Studies - We share the results of 13 research studies released this year which provide important insight into IC including new research on the incidence of men with IC, the duration of flares (men have shorter flares), the use of botox in the treatment of IC, hydrodistentions and much more! (5) Consumer Alert: Second Hand Smoke, Children and the Bladder - In a tragic twist, weve learned that second hand smoke can cause serious bladder damage and symptoms in children, which must serve as motivation to eliminate smoking from cars and homes when children are present. 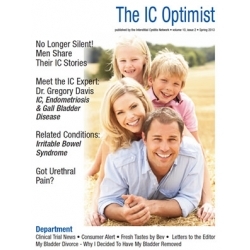 (6) More Interesting News - Dr. Drew Pinski talked about IC on his national TV show but did he do it well? We also share two important studies on e-coli based bladder infections and how factory farmed chickens may contribute to the development of "superbug" bladder infections. (7) Pelvic Pain Retreat Success - IC patient Karen Morgan describes her experience at the Beaumont Hospital Pelvic Pain Retreat. She's painfree now! (8) Shrimp & Prawns: No Small Fry in Flavor Bev Laumann shares her passion for fresh shrimp and prawns including how to select them, cooking ideas and a fabulous IC friendly recipe! (9) - Oh, The Juicy Watermelon - In an ode to hot, late summer days, IC foodies Mia Elliot and Chef Dan Norton share two recipes for refreshing watermelon desserts! (10) - Your IC Awareness Month Kit - Its that time of year again. 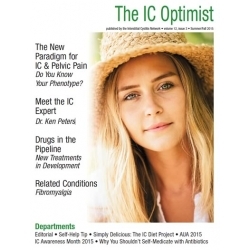 On September 1st, IC Awareness Month will kick off and we've included several resources (poster, press releases, proclamations, etc) that you can use to spread the word that IC is real and treatable! Please help us reach those patients who are suffering in silence.